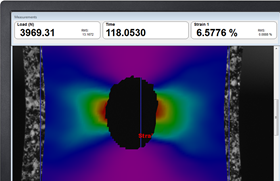 Screenshot of Imetrum's strainmap – tensile with hole. Non-contact precision measurement specialists Imetrum will be promoting its new integrated material testing system, UVX, at CAMX Composites and Advanced Materials Expo, which takes place from 16 –19 September 2016 in Anaheim, USA. Imetrum's UVX system is designed to integrate with the majority of manufacturers' test machines. The system is also designed to handle a large percentage of the ASTM tests methods and uses standard material testing language and terminology. Both the Universal Extensometer (UVX) Flexi and 3D Precision Displacement Tracker (PDT) systems, for material testing and component and assembly testing, are based on Imetrum's Video Gauge software. Each system offers measurement tools such as two and three dimensional optical LVDTs and measurement of true shear strain. Imetrum will also be demonstrating one of its software tools at the show. The Strain Map tool is application specific and measures and displays strain and displacement gradients. This story is reprinted from material from Imetrum, with editorial changes made by Materials Today. The views expressed in this article do not necessarily represent those of Elsevier.